I say horror, because at its core the police department is a violent institution. As cuddly and cute as the police can be, their authority derives from their guns. Were Meister a civilian, I believe he would have been shot “in self defense” long ago. Since he is a member of the police (for the moment), he can only be assaulted by opaque, biased disciplinary procedures. I say opaque because the department stalled long enough to delete records of calls made on a government phone. I say biased because Meister’s prosecution comes from an administration interested in its own survival. An administration which I regard as confused and--to paraphrase a village council member--dysfunctional. I believe Dave Meister is being railroaded. He’s a competitor to Brian Carlson for Chief. Meister lives in town.He’s been an officer for well over a decade starting in 2006 in Arlington Washington. He was a park ranger before that and also works as a EMT-Bin the village. Contrast with Carlson who lives outside the village limits and went from being a part time officer who started in 2010 to full Police Chief. Carlson’s work background is significantly less public service oriented. An outdoorsy background with half a dozen more years of police experience (Meister) seems more useful than a background in fine arts (Carlson) for the position of police chief in a town surrounded by nature preserves and land trusts. Though I understand that someone adept at interacting with the artsy community of Yellow Springs would be great for public relations. They both have an admirable number of public comments in their files, but it’s harder for Meister to accumulate attaboys on a 5PM to 3AM shift: Most people are asleep. Some key comments, like saving someone from drowning and thwarting the Wesbanco robbery are conspicuously missing from Meister’s file. While most of village council was busy berating regular individuals and silencing their own neighbors this month, I believe they are missing the problems in their own police department. To the point, Sgt. Watson runs the show. When asked questions about the police department in the past two weeks, Village Manager Patti Bates always references Sgt. Watson rather than Chief Carlson. It could be that in the past two weeks Chief Carlson has been out sick or on vacation and that Sgt. Watson is simply the ranking officer. Then there’s the who to be mentioned matter of Chief Carlson turning in time sheets to Sgt. Watson. When the Chief has been gone in the past, Sgt. Watson has been appointed acting chief on at least two occasions. Once in 2014, another time in 2011. I suspect she was not appointed Acting Chief after Hale’s resignation after 2016/2017 New Year’s Eve because of her part in charging a villager and village council member during the abominable affair. Another question raised concerns the tracking of hours for salaried staff. All salaried staff with the Village are on a single, official time sheet. Each time payroll is due, salaried staff complete the appropriate section of that time sheet by their name. Once all other salaried staff have completed the appropriate sections, the time sheet is returned to the Village Manager for review and approval. Once approved, that sheet is the official sheet from which all salaried staff are paid. There was a specific question about Sgt. Watson signing off on Chief Carlson’s time sheet. This was record that Chief Carlson kept for personal documentation, not for payroll purposes, and Sgt. Watson was attesting only that the hours were totaled correctly. I was given time sheets that said “Village of Yellow Springs Employee Time Sheet” and told they aren’t the official time sheets. I was given two pay periods worth of sheets (ending 1-8-2017 and 1-22-2017) before Carlson became interim chief on 1-23-2017 in the same stack as those time sheets “kept for personal documentation”. These four weeks worth of time sheets were certainly not for personal documentation. The handwriting on the 6-11-2017 period is the payroll clerk’s. It is difficult to believe that a payroll clerk would be noting anything on an unofficial time sheet labeled “Village of Yellow Springs Employee Time Sheet” kept for personal documentation in the same place as time sheets used for official purposes. Lastly, Chief Carlson's need to confirm a time sheet's hours over the phone with Sgt. Watson implies a level of urgency incongruent with documentation kept for personal uses only. From the leave report, it appears that Chief Carlson separately confirmed with Ms. Dodd for the pay period ending 9-5-2017. I can't think of a good reason to double book, unless the 9-5-2017 time sheet signed by Sgt. Watson was given to payroll. Using a convenient letterhead (it already exists, no need to make a new one). But the need to confirm hours by phone with Sgt. Watson (signing as his supervisor) implies that the records were kept for some other purpose. Especially with a whole other time sheet (leave report) dedicated to salaried employees. As well, some numbers are written in Ms. Dodd’s handwriting. Why would Ms. Dodd be making corrections on an unofficial time sheet kept for personal use only? Her handwriting is observable on the 6-11-2017 time sheet. I believe this is Ms. Dodd’s handwriting (in green) Carlson’s handwritten (in blue) 9’s are different, more slanted, as seen in his personnel file. Sgt. Watson’s handwriting (in red) appears making notes as well. The “80 hours salary” note bears similar “a” and “8” shapes to Sgt. Watson’s handwriting. Here’s some of Chief Carlson’s handwriting for comparison. He doesn’t flourish his “y”’s and he slants his “9”’s. There’s the Chief’s slanted “9”’s again. The variety of handwriting indicates that other people were looking at and commenting on these time sheets. And the hour totals are circled on every time sheet. By “every”, I mean both Carlson’s time sheets and every other officer’s. These time sheets were treated like any other. I believe Chief Carlson was reporting to Sgt. Watson. Why? Who knows. Ms. Dodd works elsewhere than the Village of Yellow Springs now, so it’s no use asking her questions. Village Manager Patti Bates is correct in her July 2nd, 2018 “Clarifications of Police Department Procedures” brief to Village Council about the primary appointing agency being the agency that receives reimbursement funds from the OAG for training, regardless of where the training was done and whether it was paid for by another department. I personally spoke to Ofc. Meister in June, who said his pay is correct. But I’m still absolutely sure that the numbers on the stubs and time sheets I was given don’t add up correctly for either Meister or Beam. I did not speak with Ofc. Beam. Further, Ofc. Knickerbocker ceased being part of the YSPD four days after the “Puzzling Time Sheets” article was published. Officer Knickerbocker, the primary subject of that article, was unmentioned in the Council Brief. Presuming Ofc. Knickerbocker communicated the training, it was not recorded.If he didn’t communicate the training, wouldn’t it have been YSPD’s responsibility to get a record of those trainings prior to requesting reimbursement? It seems poor practice to claim a reimbursement with no records. I certainly can’t get a rebate without a receipt. Furthermore, there’s still the lack of segregation of training and regular hours. A quick survey of Ofc. Bennington’s training schedule shows training taken at the YSPD. But Ofc. Bennington has no training hours recorded in her stubs for 2018. Ofc. Nipper and Ofc. Lieff are also under-hours for the reimbursement. Officer Nipper has either 12 or 14 training hours, depending on whether you look at time sheets or pay stubs while Ofc. Lieff only has a grand total of 26 or 24, respectively. Like Knickerbocker, Officer Lieff no longer works at the YSPD. It seems like the village has a lot of turnover. The attestation of requester signed by Agency Administrator Sgt. Watson clearly states that funds must be segregated. Yellow Springs likes to bill itself as a “hippie town” which embraces change and innovation. But its government’s structure is conservative and indistinguishable from any other city with policing issues. On 7-2-2018, a Village Council member said that outsiders were trying to destroy the village. Dave Meister, one of only two police officers who live in town, is being persecuted by the police department’s heads—none of whom live in town. The only other officer who works in the police department is Dennis Nipper, who is very close to retirement. 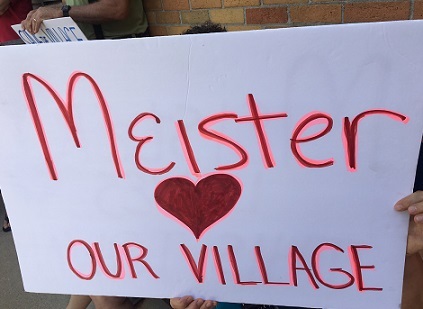 If Meister is removed from the department, the police will resemble an occupying force rather than any homegrown organ of the village. On 7-16-2018, a council member wanted to remain neutral regarding Meister’s disciplinary process. I’m not really a fan of the police. I did my own stick and poke circle-A on my thigh. I feel uncomfortable defending Meister. But to quote Elie Wiesel, “We must take sides. Neutrality helps the oppressor, never the victim. Silence encourages the tormentor, never the tormented.” Dave Meister is a villager who is ostensibly being tormented for being too lenient. If the issue really is Meister being overly lenient, wouldn’t the incidents in question have been punished immediately rather than months later? Meister is definitely not the only officer to use discretion. If the process is fair, why are more disciplinary charges being added on during the disciplinary process? There are disciplinary proceedings being opened up regarding other instances of leniency while the process goes on. Furthermore, according to the personnel files, all these charges have been leveled by Sgt. Watson, not by any of the police chiefs. What the people and village need is an elected citizen review board. Its own tribune of the plebs. A body that is elected annually rather than only a few members of the council biannually with the power to oversee the police department. The slow election cycling of elected bodies lends inertia and conservatism which reduces response time to the will of the people. Improve transparency and community oversight of police practices, being a vehicle to expose corruption. Be a watchful eye that deters police malpractice. Require automatic reporting/release of documents and question police with subpoena power. Remove police that don’t respect the community they are paid supposedly to serve. Improve police business practices including how complaints against the police are handled and how decisions get made within the department. Change local police policy. This could be a model for other communities. Enforce community values on police by setting up structures to discipline police. This has not hardly been done by other review boards. I don’t trust the bureaucracy. I don’t trust the process. The village needs to be more responsive and transparent and I don’t trust the current institutions to provide either of those attributes. The results of this disciplinary hearing will indicate whether the village’s police officers will tend towards unbending/robotic Judge Dredd/Robocop types or community/justice oriented Mayberries/Frank Columbos. On the surface, Meister is being punished for being too lenient. With a little more insight, I believe he is being punished out of fear. I believe the people most affected by the decisions the police department makes should have a say in its procedures and that the layers of administration (village council, manager, police chief) lose sight of the will of the people.